Robert William Buss was hired by Dickens’ publishers, Chapman and Hall, to provide two illustrations for Pickwick after the original illustrator, Robert Seymour, committed suicide. The publishers were disappointed with the illustrations provided by Buss and the job went to Hablot Browne. Buss, however, remained a lifelong admirer of Dickens and produced several painting celebrating the author’s work. 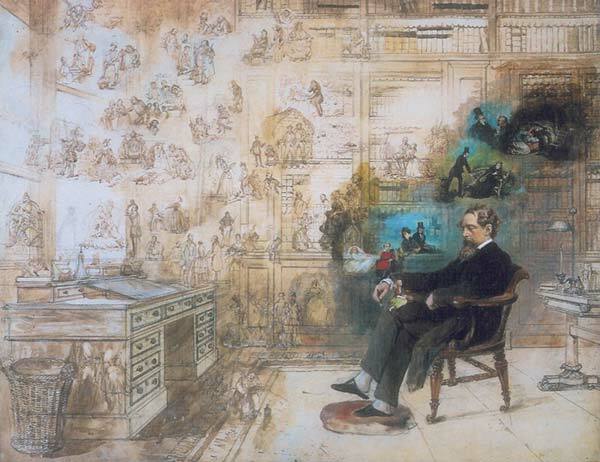 The watercolor, Dickens’ Dream, showing the author surrounded by the characters he created, was done after Dickens death in 1870. Buss himself did not live to complete the painting. I’ve been enjoying the works of Dickens’ creativity as they have been presented on Masterpiece Theater on public television (Sunday nights). I have also been having vivid dreams lately. “Real” and yet not real — as dreams are. Last night, for example, I was traveling somewhere and went to the market where they were holding an election of some sort. I asked to see a booklet that would help me understand the issues in question and then purchased $10 US worth of “vote” to cast. This was merely a sliver of all that was going on inside my head as I slept — most of it has faded like fog with the sun (or, in the case of my reality, with the lights turned on since the sun is not yet up). And on Saturday I started reading (silly me) Ted Dekker’s BLACK when it arrived from Amazon.com. SciFi-Fantasy-Action-Drama-Fiction — with a dream motif woven into the story. (I was, by the way, having the vivid dreams before I started reading this book.) I say “silly” because I am leaving in the morning and may not have time to finish the book before I go and it is a trilogy in one volume (hardback) and rather heavy. I may not want to carry it to the other side of the globe. Then again, in the book the two main characters travel from Atlanta to Bangkok and I’ll be spending a few hours in Bangkok (passing through). Maybe I should.